A handful of distorted quotes from the Quran have been circulating on blogs and anti-Islamic websites for years, but their exposure recently surged when they were paired with a picture of Rep. Ilhan Omar of Minnesota in a meme. That meme has been shared more than 50,000 times on Facebook alone. The writer, Abul Kasem, did not respond to an email seeking comment. One of the problems with the meme is that the interpretations it gives lack historical and textual context. Joseph Lowry, an associate professor of Arabic and Islamic studies at the University of Pennsylvania, explained to us some of the history that helped to form the Quran and how the meaning of the verses can be distorted out of context. Muhammad, the founder of Islam, was persecuted, at least in part, for his religious message and had to flee his home in Mecca for the nearby town of Medina. There, he and his followers remained in conflict with the Meccans, and those struggles are referenced in the Quran. Two chapters — called surahs in the Quran — out of a total of 114 discuss most directly this political and military conflict with the Meccans. They are surahs eight and nine, and two-thirds of the verses in the meme come from them. We went through the nine interpretations that are included in the meme with Lowry and compared them with an online resource from the University of Leeds that draws from some common English translations of the Quran. Lowry said this passage poses a difficult translation problem since the Arabic word for Islam means something like “to submit.” This passage could refer to all monotheistic religions, as opposed to pagan religions. “It’s not clear that this doesn’t include Jews and Christians,” he said. Lowry noted that this passage refers to a specific historical battle — the Battle of Badr, in which Muhammad made his first significant victory. In this verse, God is urging the angels, not Muhammad’s followers directly, to help his followers during the fight, he said. Lowry pointed out that this verse calls for military service and aid to Muhammad’s followers. Generally, verses like this one are limited to the specific historical tension in Medina and Mecca at the time, he said. Lowry identified this verse as part of a treaty between Mecca and Medina. In its historical context, this verse refers to the Meccan pagans with whom Muhammad’s followers were fighting. Lowry said this verse did not call Jews and Christians “perverts.” He said, “It certainly doesn’t say that.” Also, the verse doesn’t have an imperative verb urging Muhammad’s followers to fight. Rather, it has an optative verb, one that expresses a wish; in this case, wishing that God would fight. Lowry said that this verse is probably best understood as referring to the military situation around Medina. As with many historic texts, the Quran can be challenging to translate, and reasonable minds can differ about how best to do it. But Lowry concluded that some of the interpretations given in the meme are mistranslated, and all of them are taken out of context. “It’s designed to be inflammatory when presented and translated like this,” he said. Kasem, Abul. “Whither the Islamic Infidels?” Islam-Watch.org. 23 Jun 2005. Muhammad — Prophet of Islam. Encyclopaedia Britannica. Accessed 14 Mar 2019. Sahih International. “The Quran: Arabic Text with Corresponding English Meanings.” Abul Qasim Publishing House. Corpus.quran.com. 1997. Ali, Yusuf. “The Holy Quran: Translation and Commentary.” Reprinted by Islamic Vision. Corpus.quran.com. 2001. Sarwar, Muhammad. “The Holy Quran: Arabic Text and English Translation.” Elmhurst. Corpus.quran.com. 1981. Arberry, Arthur John. “The Koran Interpreted: A Translation.” Reprinted by Touchstone. Corpus.quran.com. 1996. Shakir, M.H. “The Holy Quran Translated.” Tahrike Tarsile Quran. Corpus.quran.com. 1999. Hossein Nasr, Seyyed. The Study Quran. HarperCollins Publishers. 2017. 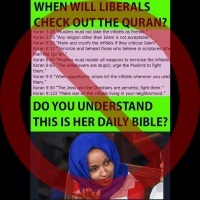 A meme that asks "When will liberals check out the Quran?" lists nine supposed quotes from the Muslim holy book.